Despite having the lowest budget among Euroleague Playoff teams, Zalgiris Kaunas has succeeded with an efficient offensive style. This post, 1 of 4, focuses on ZK’s Horns series. The 2017-18 EuroLeague season has been the most competitive of all time. Only three games separated 3rd place from 8th place in the league standings. Zalgiris Kaunas had one of the most efficient offenses in the league, despite having no “star players” on paper. 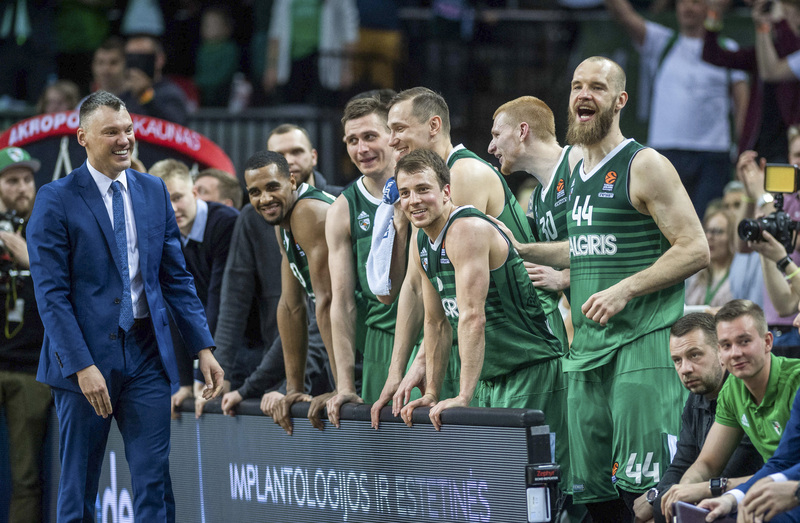 Few believed it had a chance to reach the Final Four – simply making the playoffs was already a great result for Zalgiris. However, that was not going to be enough for Head Coach Sarunas Jasikevicius, known as one of the most competitive players in EuroLeague history. This is his first year at the helm of the club, and everything behind its success this season begins and ends with his coaching style. Jasikevicius is a true EuroLeague legend as a player. He’s the only player to ever win the EuroLeague crown with three different clubs (Panathinaikos, Maccabi Tel Aviv and FC Barcelona). He was twice named All-EuroLeague First Team. In 2005, he was awarded Final Four MVP. One of the best Lithuanian guards in Basketball History. Zalgiris Kaunas is the first coaching experience for Sarunas Jasikevicius in his life. While still playing, Saras was once asked the question: “Will you become a coach after your storied playing career?” He answered: “No, because I will have to coach players with the same character as me. Alas, he became a coach after all, and everybody understands why. Jasikevicius’ coaching style and character are quite similar to whom most regard as the best EuroLeague Best Coach of all time, Zelko Obradovic, currently leading Fenerbahçe. We could call this style one of an “honest dictator,” as Saras does not hesitate to point at player’s mistakes in an angry form, but he always cares about the progress of players. Zalgiris Kaunas has the second-lowest budget in the entire league, which doesn’t allow it to always pay superstars to come play for it. But Coach Jasikevicius has built ZK into one of the most efficient and effective basketball clubs in the EuroLeague despite the financial obstacles. Players do not come necessarily arrive at Zalgiris as stars, but under the team’s new leadership, development and playing style, they often become so. Let’s take a look at some of the sets Zalgiris Kaunas has run to take advantage of defenses and earn a trip to the EuroLeague Final Four. Click on a diagram to download it to your FastDraw library. This classic Horns play becomes deadly with a center who can shoot mid range to 3-pt. Defenses often play a flat or aggressive hedge on 1-5 PNR to avoid a mismatch on switch, so 5 is wide open 50% of the time in this Pick and Pop situation with option to shoot or attack the basket. Great counter to the classic Horns Flare play, which so many teams in Europe run. Rather than another forward at the post, Zalgiris places 2 here. After flare screen from 5, 2 curls to the basket. It forces help from x3, causing the defender to be late to defend next action, a 5-3 pindown. If defenses start switching all screens, 5 can slip to the basket to keep the it honest. 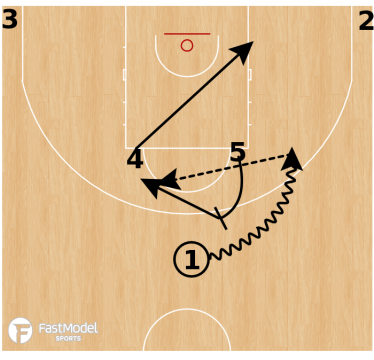 Horns Exchange is a common set in Euroleague, the main advantage here is speed. Because of high speed and lots of motion on last 2-5 PNR every time will be advantage no matter about defense go over, under or switch, Advantage to drive or mismatch will be every time because of speed and misdirection. Here is a first counter to Horns Exchange. Shake works because often x1 will help on 5 rolling to the basket, so it’s a chance to screen him and get 1 a wide open three. Here is a second counter, which ZK runs for its best shooter, A. Milaknis. X3 in previous two sets not participate in active defense, so stagger action is often surprise for x3 and Milaknis get a Wide Open Three. This final Horns play utilizes a 4-5 PNR, which is effective as all of ZK’s forwards are versatile playmakers who can handle the ball. It also works because 4 initially fakes a DHO with 1 before beginning the PNR action, putting x4 a step behind from the get go. Check back for parts 2-4 covering other series from Zalgiris Kaunas, including Iverson, Spain PNR and ATO/EOG.